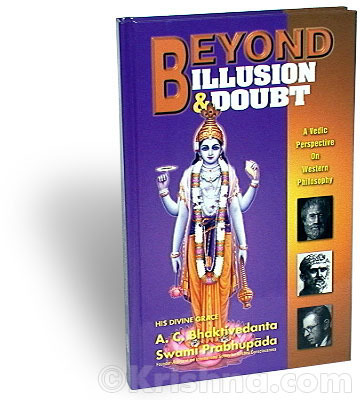 Beyond Illusion And Doubt—formerly entitled Dialectic Spiritualism—is a compilation of conversations with Srila Prabhupada comparing the conclusions of Vedic wisdom with those of Western philosophers, such as Aristotle, Socrates, Plato, and many others. Srila Prabhupada gives each credit for their sincerity, but after all, to err is human, human life is short, and there's only so much that even the greatest philosopher can know. It's possible to know something about Ultimate Reality by intellectual endeavor, but for perfect and complete knowledge, one must approach the source. The title alludes to Krishna's famous assurance to Arjuna in the Bhagavad-gita, "Now hear, O son of Pṛthā, how by practicing yoga in full consciousness of Me, with mind attached to Me, you can know Me in full, free from doubt. I shall now declare unto you in full this knowledge, both phenomenal and numinous. This being known, nothing further shall remain for you to know." The conversations in Beyond Illusion And Doubt turn again and again to the commonsense conclusion that, without reference to an absolute, unchanging truth (a supreme authority), we'll never really know anything for certain.